The Sign Is Still Up…. Friends, tax-free weekend got us wrapped up in a sale frenzy, and we’re still celebrating! Rachel is off to Paris for a week, so while she gallivants amidst the art museums and general joie de vivre, she’s left us with sale treats throughout the store. Nearly everything is marked down, and the sale will continue until next week when Rachel returns. Safe travels to all, and to all a good sale! In honor of our Hill Center birthday, the state of Tennessee has declared that there will be no sales tax on clothing under $100 this weekend. OK, so maybe the tax-fee weekend holiday wasn’t created JUST to celebrate our birthday, but we’ll interpret it as such. And in order to make the celebration even better for you, our near & dear, we’ll be marking EVERYTHING in the store to under $100. Yes, you read that right. Friday, Saturday, and Sunday, everything will be under $100 AND tax-free! And to make the story that much sweeter, we’ll have live music Saturday afternoon, starting at 3PM. 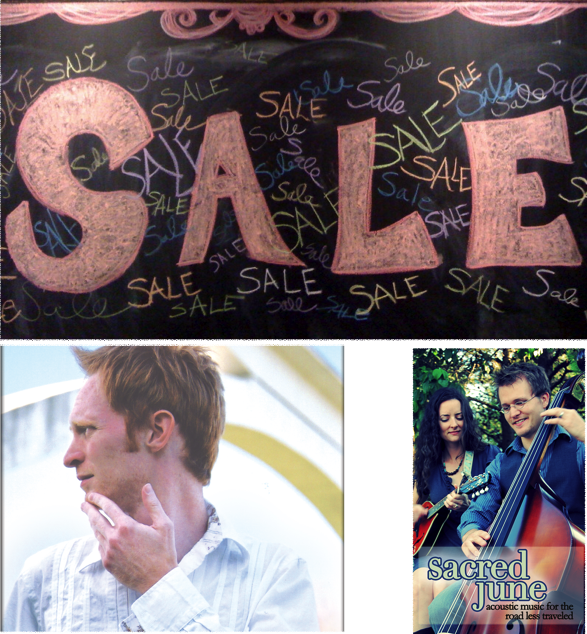 Come shopping then to also enjoy John Martin Keith and Sacred June.